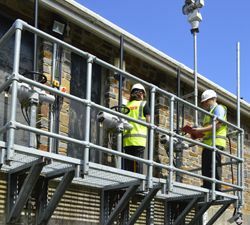 An extended scope contract performed by Rotork Site Services has successfully delivered full automation of a flood alleviation scheme protecting the historic town of Cardigan in West Wales. The project involved replacing unreliable actuators from another manufacturer, installing a PLC control cabinet and interfacing with the existing river level sensor and telemetry system. 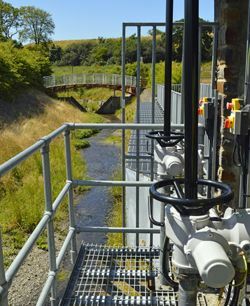 The River Mwldan flood alleviation scheme, showing two of the new Rotork actuators in the foreground and the V notch weir in the background. The over-spill grid is in between. The flood alleviation scheme on the River Mwldan above Cardigan was constructed 20 years ago by the local authority to reduce flooding in the local area. It consists of a V notch weir, an over-spill grid into a culvert that travels approximately half a mile through the hillside into the estuary and three flushing penstocks. In 2006 the scheme was adopted by Natural Resources Wales (NRW – formerly Environment Agency Wales) to operate and maintain. Since then, NRW has installed CCTV and telemetry to enable remote visual monitoring of the site from central control rooms and mobile devices. 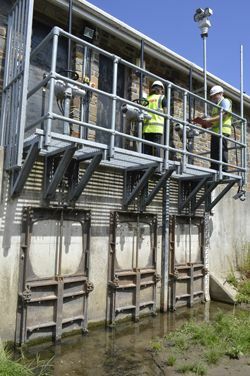 During recent periods of intense rainfall the weir has been at the point of over-topping and, to reduce the flood risk, two of the penstocks were opened. As well as proving the vital importance of the penstocks, these events also highlighted the unreliability of the electric actuators originally installed. Poor environmental sealing had enabled moisture to enter electrical enclosures, causing operational failures. The problem was aggravated by the design of the actuators’ manual operating mechanism, which demanded lengthy and laborious handwheel operation to open the heavy penstocks. As a result, NRW decided to replace the actuators and at the same time introduce full automation of the flood alleviation scheme. 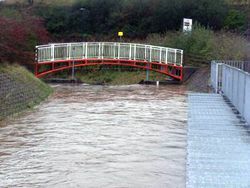 The River Mwldan in danger of over-topping the weir in 2014, before the automation scheme was installed. The extended scope contract awarded to Rotork Site Services encompassed all aspects of the task, enabling Rotork to organise the total supply of the work together with project management services. A major benefit of this approach for the customer is the simplified contractual route that the extended scope contract enables, by minimising the number of separate sub-contractors that need to be employed. 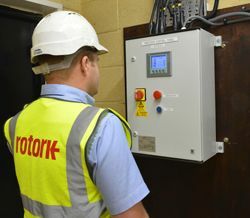 Rotork’s responsibilities included an initial survey, removal of the old actuators and replacement with new, installation of a PLC control cabinet with HMI for local control and indication, interfacing with the level sensor and telemetry system and commissioning of the completed installation. The new Rotork IQ12 intelligent electric actuators installed are controlled by the PLC, using the signal from the river level sensor. The actuators operate in 5% travel increments (each equivalent to approximately 45mm of penstock travel) at trigger points shown on the table below. The new Rotork IQ actuators installed on the three flushing penstocks. The level sensor that controls the operation of the actuators via the PLC is situated in the downpipe installed between the back two penstocks. Note also two of the site’s CCTV installations for remote visual monitoring of the river. Operation of the site is now fully automated and remotely monitored. The Rotork actuators provide position feedback and alarm signals to the PLC and the telemetry system. Alarms include obstructed penstock, which the actuator will automatically close, and power failure, after which the system will automatically restart. If necessary, the automatic system can be overridden and the actuators can be operated remotely via the telemetry system or locally via the HMI panel on the PLC control cabinet. The new actuators are controlled by the PLC cabinet which is interfaced with the telemetry system.